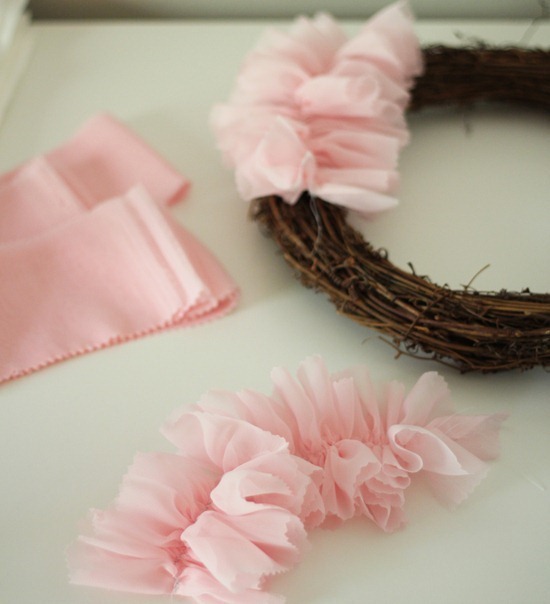 I made this little pink wreath for Sophie’s room last week, trying to mimic the beautiful one I saw here. I love the way it turned out…and it only cost me $6 to make. 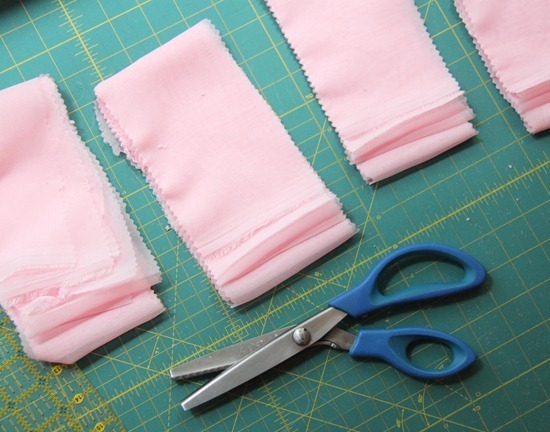 I bought a yard of this lightweight/sheer pink fabric at Joann’s…and cut it into strips (about 4″) using pinking sheers. Then I used my super scientific way of gathering the strips….set the machine to a zig-zag stitch (only so the gather doesn’t unravel) and shove/gather/push/bunch the fabric under the foot using your hands on either side of the presser foot as you go. It works like a charm on lightweight fabric like this. Then I gathered each strip again…making them twice as ruffled. Just gather the strips until they are fluffy and full. It would make a cute garland wouldn’t it? Then I hot glued the gathered strips to the top and sides of a little wreath I bought in the dollar bins at Target…until it was nice and full. 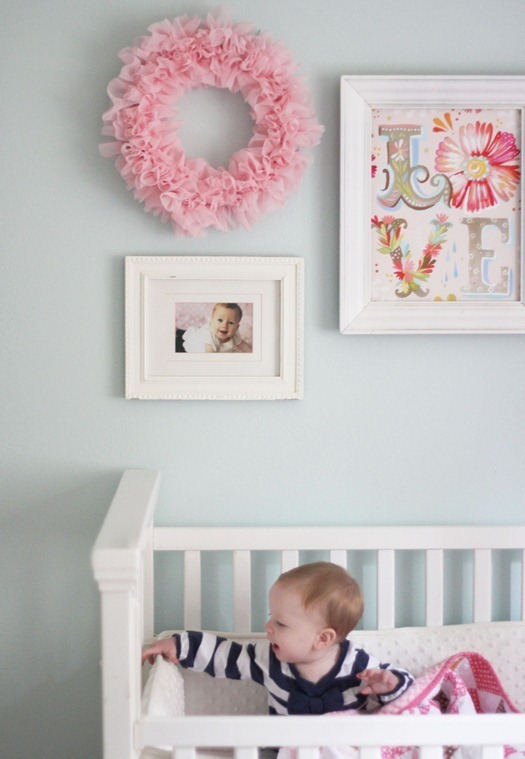 It looks cute above her bed with the white frames. Although now that I look at it I’m going to need to re-adjust her mattress down and move those pictures up right now! The LOVE print up there is by Wheatfield (in a frame I bought for $1 at a garage sale!). Brought to you by the letter "P"
Too cute! She's getting so big! Perfect for a sweet little girl! adorable!!! both wreath and the baby!!! This turned out so cute! Don't you just love quick, easy, and cheap crafts like this! thank you for sharing this! 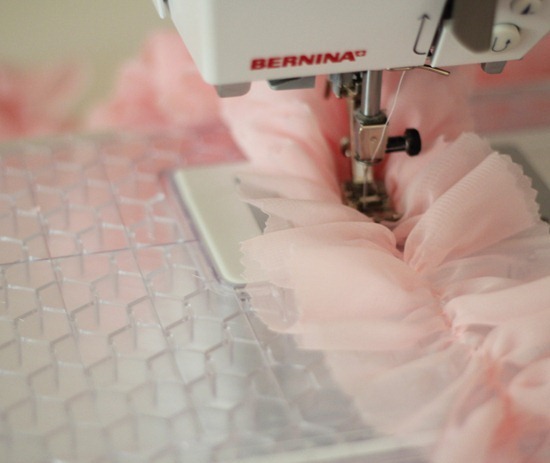 I have some gauzy white fabric with silver sparkles on it–I think it would make a perfect winter/christmas wreath! I'm so going to try this! Precious for your little one!! It looks so frilly and feminine! You had me at pink! Absolutely gorgeous! Super cute! I love the prints from Wheatfield. I actually have a couple of them in my baby girl's nursery, too. In spray painted Goodwill frames no less! Very adoreable! Just a reminder to make sure those frames and wreath are hung on tight to the wall here in earthquake country. Especially above baby's bed. 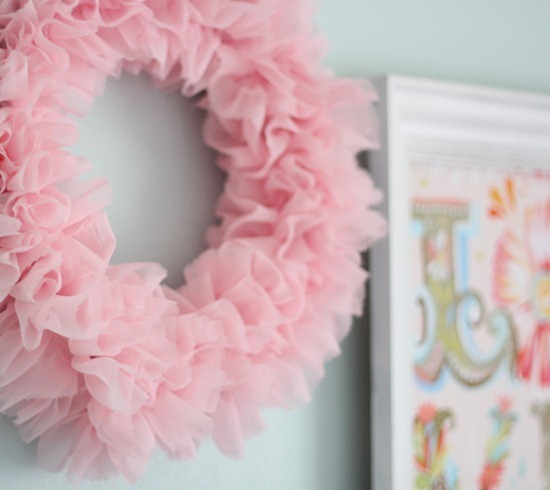 I am not at all a girly-girl but right now I want a wreath like that so much I'd be willing to permanently reconsider my stance on really frilly things. It's gorgeous. I love it. And your wee one is so adorable! Everything you do is just so darn cute! And your wee little babe is pretty cute herself! This is so cute. I have two granddaughters moving into a new house soon and a pink garland would be just the ticket for their new bedrooms. Might have to make each one a different pink though. Beautiful wreath, and such a sweet picture of Sophie!! She is so cute!!! Gorgeous! Both the wreath and the little baby! What a beautiful wreath – and I love that you made it yourself and saved a ton of money! Thanks for the link to The Wheatfield, her art is wonderful! I really enjoy your blog!! That is really cute! It looks fairly easy. Yours looks softer than the other one. And wouldnt that look pretty for Christmas with tiny pink round shiny ornaments in it? Oh my is that ever cute!!!! What a great idea – and I love that it is in the budget! I am saving this idea to try for sure! very clever and pretty. your model just steals the show. too adorable. I love your wreath, and the entire wall is precious!! On she is so darling and so is her wall. They grow so fast. Hope grandma is close enough to enjoy her. Beautiful, love it, It looks fantastic on the wall. Very cute wreath – but even CUTER little Sophie!! For future reference – you can gather easily by using a thin crochet thread or even yarn – secure the crochet thread to the fabric at the beginning and then zigzag over it (make sure you don't catch the thread – all the way to the end, then gather it up! Works like a charm for ALL gathering because the crochet thread never "snaps" like sewing thread can! You just cut off the extra crochet thread at the end AFTER securing the thread to your fabric – roll it in a ball (or whatever) and use it for your next project!! What a great idea, it looks beautiful (as does Sophie). Such a cutie…and you are right, better move that stuff. It will be in her hands before you know it! 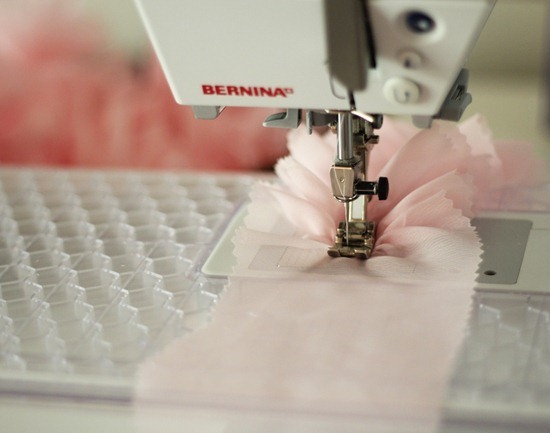 With all my sewing machine attachments and sewing things I have learned….the scrunch-shove-sew method of gathering is still my favorite and most widely used! The wreath turned out so sweet and frilly. I like it better than the original! Thanks for sharing! Love your wreath, have to make one for my granddaughter.Thanks for sharing. I have a lot of that fabric to make dance skirts ,not, so now will become wreaths.